Trump fired this one off at 8:03am as the Senate convened for a cloture vote on accused sexual assaulter and Supreme Court nominee Brett Kavanaugh. In an even more macabre twist, Trump’s dog-whistle ties the bigoted trope of shadowy Jewish financiers to the bravely vocal survivors of sexual assault and trauma fighting for their lives. It implies that we Jews are funding the very women they’ve accused us of lusting over and coveting for generations. First of all, it wasn’t a dog whistle. I showed the President’s tweet my dog Soos (Soos is Hebrew for horse, my daughter wanted a horse, and the dog was as close as I was willing to go). After looking at the tweet, I could tell Soos was not impressed. She looked up for a half-second and then rolled over on her back which is her way of ordering one of her pet humans to rub her tummy. A July Daily Caller post reported that Soros was the money man behind one of the big anti-Kavanaugh groups, Demand for Justice which is run by former Hillary mouthpiece Brian Fallon. BTW Demand Justice is led by former Hillary Clinton press secretary Brian Fallon. My friend J.E. 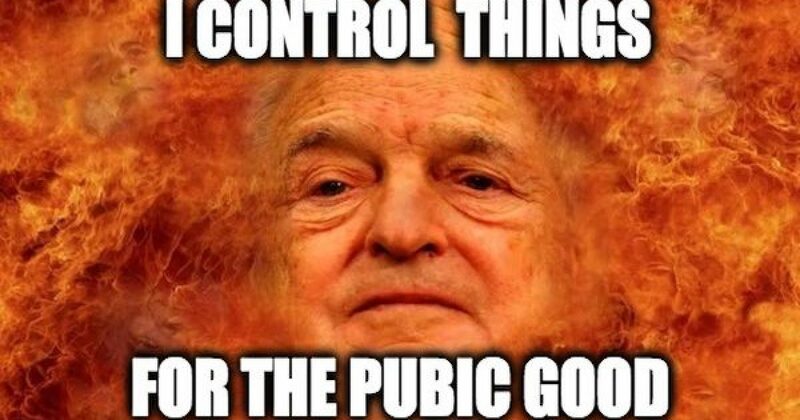 Dyer who blogs at Liberty Unyielding pointed out that one of the lawyers for Kavanaugh’s accuser Debra Katz is the vice chair of the board of directors for the Project on Government Oversight (POGO), a Soros-funded “watchdog” group. I’m sorry but the “Soros is paying them” trope from the president of the United States is … wow. Read (((Semitism))): Being Jewish in America in the Age of Trump. Getting to the Flake’s elevator ladies specifically. The fact is that during an interview on MSNBC Friday, Ana Maria Archila, one of the elevator ladies who confronted Flake confirmed she is the executive director of the Center for Popular Democracy (CPD) and did not deny Trump’s characterization of her efforts. The CPD is indeed heavily funded by George Soros through the Open Society Foundation. And Ana Maria Archila’s fellow elevator lady Maria Gallagher is an activist with CPD. Soros also helps to fund The Woman’s March group. Which led some of the recent Washington DC protests. The Woman’s March organization is run by anti-Semites, but we never hear about that. Since 2001 the Soros network has given $2,688,561 to Adalah. According to NGO Monitor, Adelah describes itself as “independent human rights organization.” Adelah has been instrumental in falsely accusing Israel of war crimes on numerous occasions, including contributing charges to the now-disgraced Goldstone Report and the fake 2002 report of an Israeli massacre in Jenin. Adalah has also called on governments the world over to sever or downgrade their diplomatic relations with Israel. Another favorite for Soros money is I’lam, is a Nazareth-based Palestinian media center. I’lam claims its mission is “to empower the Palestinian media landscape and society by promoting equal access to the Israeli media, encouraging a fair information-flow, and fostering professional standards.” Not stated in their mission but reported by NGO Monitor is the fact that I’lam creates and promotes allegations of media bias in the Israeli media as part of its political agenda. I’lam received about $1.1 million from the Soros organization. The New Israel Fund (NIF) is also listed as a recipient of Soros’ love, $837,500 since 2009. The NIF donates money to anti-Israel groups dedicated to making false charges and/or promote the anti-Semitic BDS movement against the Jewish State including Adalah, B’Tselem, Breaking the Silence, and Physicians for Human Rights, Social TV, and 972 Magazine, just to name a few. Women Against Violence (WAV): received $1,430,000 of Soros and also supports the antisemitic BDS Movement. There is also some evidence that Soros was involved with the recent Facebook Purge. On the other hand, anyone who says President Trump has a single anti-Semitic bone in his body is a fool. Putting aside for a moment, that for Trump to be an anti-Semite he would have to hate his daughter Ivanka who is a Shabbos-observant Jew, as is his son-in-law Jared Kushner, and their three children. The president’s son Eric’s wife, Lara Yunaskav, is Jewish according to Jewish law (because her mom is Jewish), and their new baby is technically Jewish for the same reason. Trump has been very generous in donating to Jewish Organizations, and that’s how he earned the honor of being grand marshal of the Israel Day parade. In Jewish charities, typically the highest honors go to the biggest donors and BTW that was all before he entered politics. Trump counts Jews among his circle of friends, including Israeli Prime Minister Netanyahu (something that was very obvious when he visited Israel in May) and New England Patriots owner Robert Kraft. As for support for the Jewish State, Donald Trump may be the most pro-Israel president ever. Putting it all together, the proof seems to be that Soros did fund many of the Kavanaugh protest groups, including sending the elevator ladies to go after Senator Flake. George Soros was born Jewish but not a big friend to the Jewish people and has tried to hurt the Jewish State. And finally Trump may be the most pro-Israel President in American history, and if he were actually an anti-Semite, he would hate his daughter Ivanka and all of his grandchildren. However, if any of those liberals want to really find a president who spewed anti-Semitic dog whistles, I have done some homework, and discovered an ex-president who did that..his name is Barack Obama.